We are largest manufacturer of Water Immersion Heater. These are used in various purpose like heating water for bath, water solution. Heater Material Stainless steel ss304/316/321/Incoloy 800 etc. 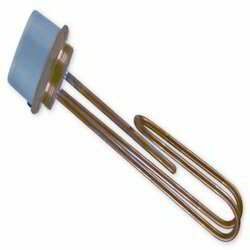 Industrial Immersion Heater offeredcomes in quality construction finish and provide for superior electric properties and are suitable for use in liquids like water, heating cabinets or tunnels. Further, these are also easy to install, control and maintain and suit the usage demands in corrosive environment. Some of its features include can be provided with additional Teflon sleeving support; option of different materials like stainless steel, titanium, Incolloy sheath, copper; option of different diameter sizes; finding suitability for use in areas like water and oil heating appliances and plastic processing machinery. Our company offers an extensive range of Industrial Water Immersion Heater that are highly suitable for heating water solution, heating of water baths and water jacketed apparatus. these are fabricated using steel or copper tube with diameter of 8.2 mm to 8.5 mm covered with nickel plated. we offer these as per the needs and specifications of our esteemed clients. We are a leading manufacturer and exporter of a wide range of Industrial Heater. Our product range includes cartridge heating element, porcelain heating element, stripe heating element. 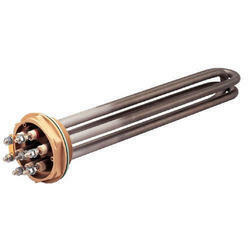 A wide list of our product also comprises of glass heater, oil immersion heater, alkaline immersion heater, trace heater, bobbin acid immersion heater, lead cover immersion heaters, etc.